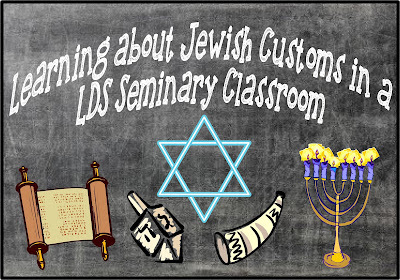 I don't know how your seminary year is going, but I am having a hard time keeping up with my lessons so that I am on track for the assessment test. Since it is Hanukkah I really want to incorporate the holiday into my daily lessons. This week is a four day week for my class. I thought that I would just touch on a little bit of Hanukkah every day this week. I will give you an overview of what we did to celebrate. I introduced the holiday to the class. I decorated with some Jewish garland that I bought at Hobby Lobby for half price. Below is a outline of the holiday with a link for more information. Since we are studying Numbers 15 where the children of Isreal were commanded to wear the blue tassels I could tie it into the Jewish blue of the Hanukkah holiday. Here is a great explanation of the blue from the Institute manual. The ribbon of blue also symbolically suggested concepts of deep importance. Blue signifies the heavens and so symbolizes the spiritual realm or godliness (see Fallows, Bible Encyclopedia, s.v. “colors,” 1:440). Aish.com has this amazing Hanukkah information sheet on how to celebrate Hanukkah. We discussed what it meant and what we need to do to be a peculiar treasure. I explained that it is part of the Hanukkah tradition to give out this candy. I told the class about the Apocrypha. You can read about it here in the D&C Student Manual. The Latka comes from the story of Judith that is in the Apocrypha. So does the story of Hanukkah. Without going into a lot a detail, I gave them this explanation of Judith. When the Assyrian armies were attacking a town near Jerusalem, a beautiful woman named Judith wanted to save her town. Judith snuck into the invading armies camp where the general spotted her and invited her into his tent for dinner. She fed the general salty cakes to make him thirsty for wine. When he was drunk she chopped off his head with his own sword and took his head back into town. When the army found their general headless, they left town. Judith saved her town from the invading army. I cooked the class some potato Latkes. I combined a couple of different recipes that I found online. You will need onion, salt, potatoes, eggs, flour and peanut oil. While the recipe works with any type of potato, using Yukon Gold is recommended. Drain and dry the potatoes the best you can. Mix all the ingredients in a bowl. Heat the peanut oil in a heavy frying pan. Using either a 1/3 or a 1/4 cup measuring cup drop the potato mixture into the oil. Use the back of the measuring cup to flatten the potato mixture into a flat pancake. Fry 2-3 minutes. Flip when the potatoes are golden brown. Brown on the opposite side for 1-2 minutes until golden brown. Serve hot with sour cream and green onions or apple sauce. I also found this frozen hash brown latkes recipe on aish.com. It's much easier for those of us who are teaching early morning seminary. Just click here for the recipe. 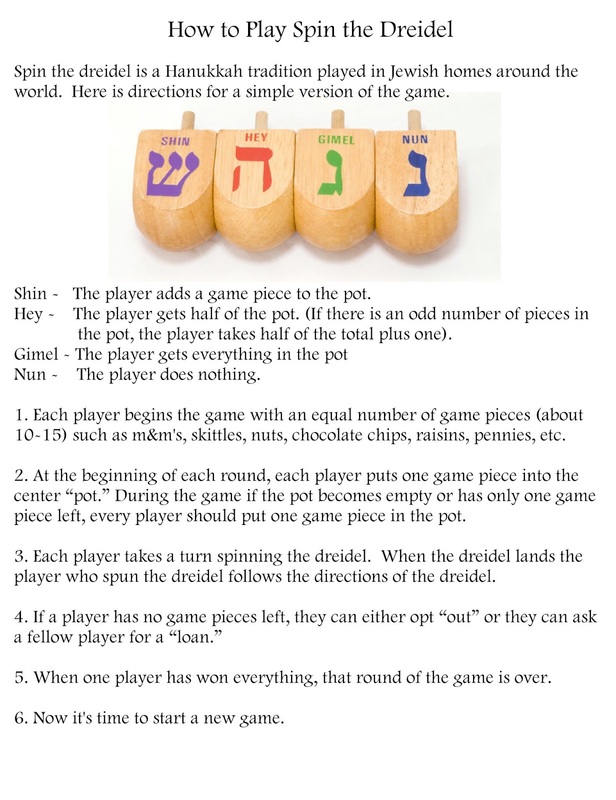 We played the dreidel game at the end of class. I used a honey cereal for the markers. I also served donuts to the class in honor of the Jewish tradition to have donuts made in oil. For a fun article you can read "The war is all about the oil" on Chabad.org. I bought some dreidels at Hobby Lobby. Luckily they were half price! Target sales them in packs of 8 for $1, but they were sold out. 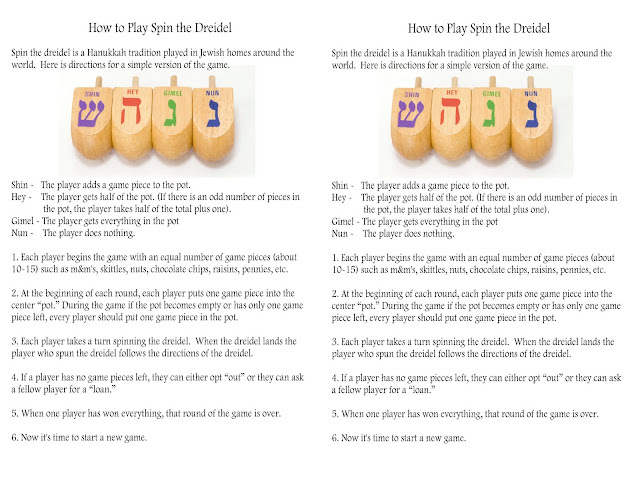 For rules on how to play the dreidel game from MyJewishLearning click here. 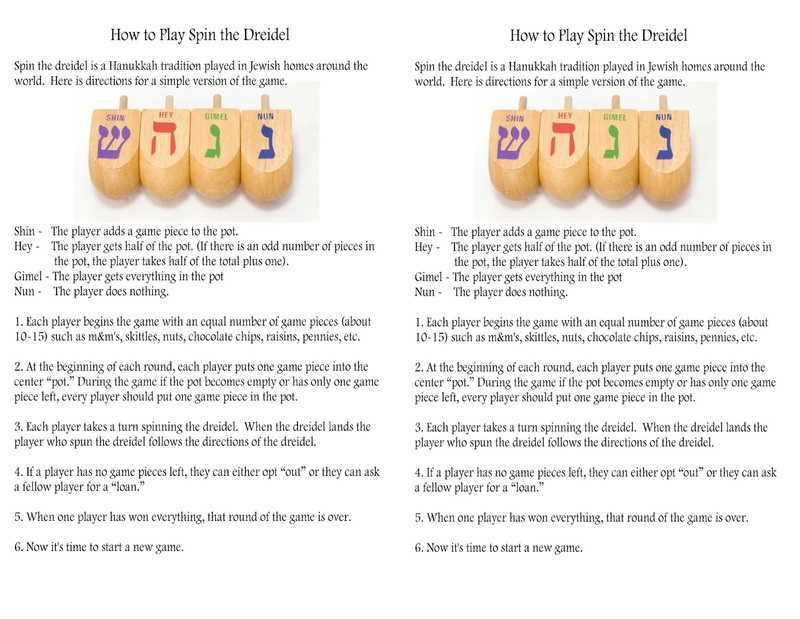 Hanukkah - Dreidel - music video by Jewish a cappella group Shir Soul - Happy Hanukkah! We had a great time discovering the Jewish holiday of Hanukkah. 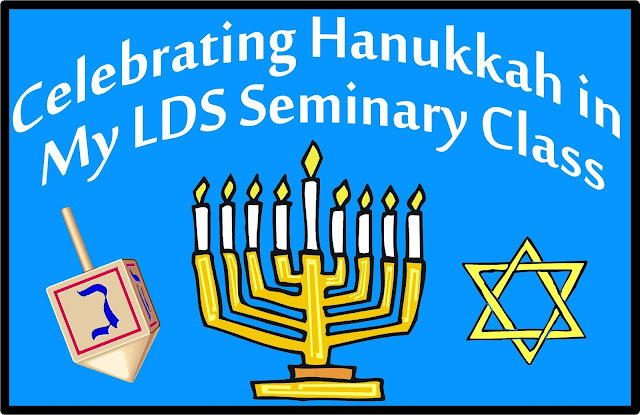 To see other ways that I have celebrated Jewish holidays click here.